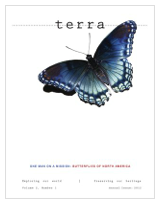 We're pleased to announce we've released the 2012 version of our annual publication, *t e r r a,* the journal of science, exploration, and culture. - and ConserVentures founders Roseann and Jonathan Hanson share their first TERRA Expedition to help the Maasai of Kenya's South Rift preserve one of the most famous emblems of their heritage. Download a free PDF issue from our website here, or visit our publising partner, Magcloud, to order a beautiful print version. Of course, we don’t get the spectacular fall foliage that blankets states such as Vermont in swaths of yellow, red, and orange (unless you head to our nearby mountains . . . ). But nature compensates us for that: We get two springs. The geography of the Sonoran Desert region, while it restricts the overall amount of rain that falls each year, breaks what does fall into two major periods—one in July and August, another in December and January. The summer rainy season is characterized by brief, powerful thunderstorms that originate in the tropical Pacific Ocean or the Gulf of Mexico; winter rains are usually more gentle and of longer duration (and, of course, colder), and sweep down from the northern Pacific. In good years each season will result in about four or five inches of rain—perhaps 10 inches annually. Not much by the standards of Vermont residents, who’d cry “Drought!” if they failed to get three times that amount—but desert plants and animals have evolved to exploit every drop. Blood & Leather Project launched on Kickstarter! 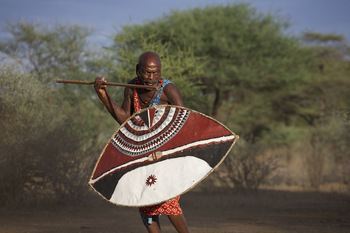 The Maasai cultural conservation project Blood & Leather launched today on Kickstarter. Please take a few minutes to watch the short but exciting video, and then consider becoming a backer and share with your friends and family. Kickstarter is "all or nothing" funding, so if we don't meet our $7,800 goal by August 4, we don't get funded! Gary & Sharra Haynes at the ConserVentures safari booth. Click photo to see full gallery.Gary & Sharra Haynes (Gary runs our Resources for Rangers program) put together a beautiful, fun, and informative booth for ConserVentures at the 2012 Overland Expo (a major contributor to ConserVentures programs). In addition to several safari tents and furniture, they offered an old-fashioned (but digital) photo booth, where people could dress up in safari clothes and accessories, get their picture taken, and have it emailed to them (for a donation). Fun and successful! Click on the photo at left to see the full gallery. Teenage Mutant Ninja Turtles spurred an increase in the black market trade for turtles and tortoises.It’s a powerful comment on the miraculous complexity of life on earth that scientists are still regularly discovering new species. Not just plants and insects, but everything up to large mammals—and a surprising number of reptiles and amphibians. Unfortunately, there’s a hazardous downside to these herpetological discoveries: A nasty subset of herp collectors in the U.S. and Europe covet rare species to add to their menageries. Not only do these twisted individuals not care that it’s against the law to import or keep such animals, the very designation of “threatened” or “endangered” adds to the cachet of the acquisition. The rarer the better—consequences to the wild population be damned. A recent BBC News story of a handsome species of newt discovered in Laos in 1999. The biologist who recorded it, Bryan Stuart, innocently published an article describing the black-and-yellow animal and its habitat. Six years after Stuart’s paper was published, the newt was nearly extinct in the wild, the result of massive collecting by locals to feed the black market pet trade. 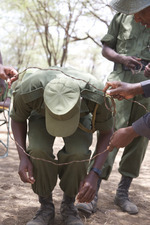 Despite a language and culture gap many would consider formidable, two law enforcement rangers from the U.S. Park Service bonded instantly with a group of 28 Maasai game scouts from the South Rift in Kenya. During an intensive, ConserVentures-sponsored three-day workshop held at the Lale’enok Resource Center, about 90 miles south of Nairobi, Gary Haynes and Michael Hardin shared their training and experience in tactics for tracking poachers who might be armed and capable of laying an ambush to surprise their pursuers. In return, Gary and Michael were embraced as brethren by the Maasai rangers, who quickly recognized and valued their shared professionalism and similar challenges, and who gave as good as they received in explaining fieldcraft relevant to the African bush. Michael Lenaimado, head of the scouts and fluent in Maa and English, translated throughout the training, but after the first day or two much of the one-on-one interaction seemed to take place more by telepathy than talking. The workshop has come to a very successful close the final day wrapped up with a crime scene management session. The rangers and the instructors had a fantastic time, sharing and learning a great deal. 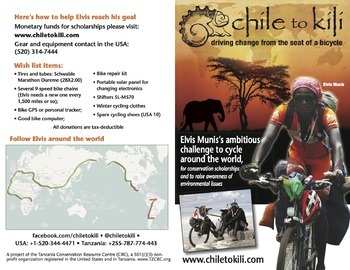 We will post more images in about 2 weeks, we are leaving to take the instructors and volunteers on a safari in Kenya and Tanzania. ConserVentures Reporting from Kenya: Michael Lenamaido, director of the South Rift Game Scouts, discusses recently apprehended endangered sandalwood stolen from Suswa Conservancy, with ranger workshop instructors Gary Haynes and Michael Hardin.